It will probably come as a surprise to absolutely no one that I grew up in the kind of household where the exact range of probabilities covered by the phrase “more likely than not” was a topic of heavy and heated debate. While the correct answer to that question is obviously 51%-60%1, I think it’s worth noting for everyone that this sort of question that actually has some scholarly resources for it. 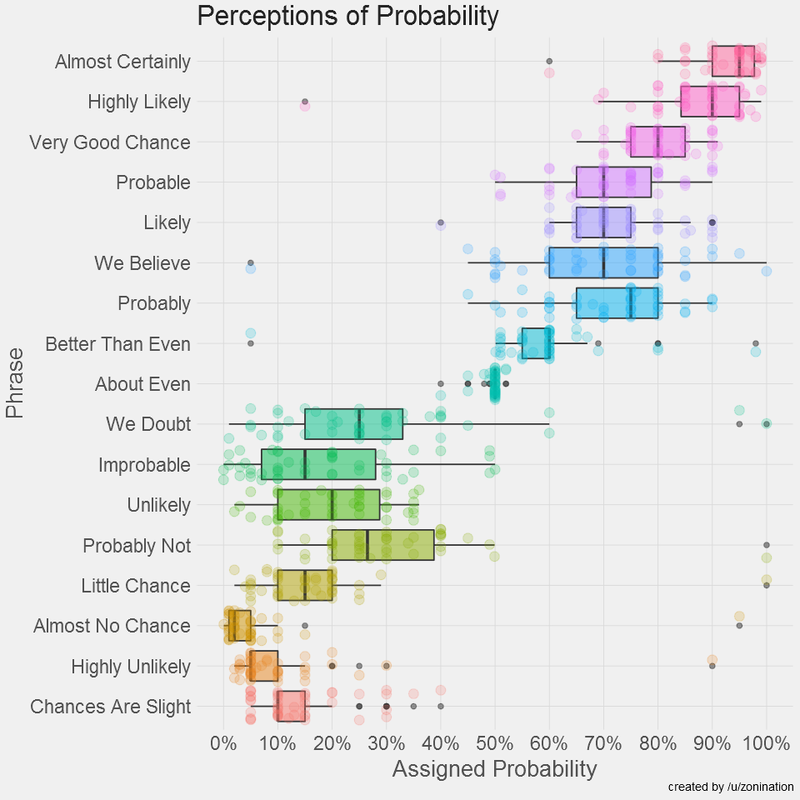 Interesting that the term “probable” itself seems to cause the widest range of perceptions in this data set. 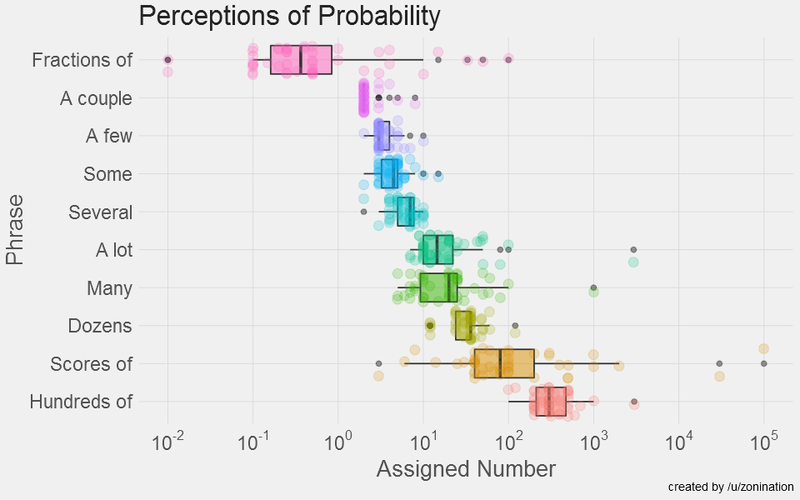 This is some pretty interesting data for any of us who attempt to communicate probabilities to others. While it’s worth noting that people had to assign just one value rather than a range, I still think it gives some valuable insight in to how different people perceive the same word. I also wonder if this should be used a little more often as a management tool. Looking at the variability, especially within the NATO officers, one realizes that some management teams actually do use the word “probable” to mean different things. We’ve all had that boss who used “slight chance” to mean “well, maybe” and didn’t use “almost no chance” until they were really serious. Some of the bias around certain terms may be coming from a perfectly rational interpretation of events. Regardless, it makes a good argument for putting the numeric estimate next to the word if you are attempting to communicate in writing, just to make sure everyone’s on the same page. Some of those outliers are scary. “Words strain, Crack and sometimes break, under the burden, Under the tension, slip, slide, perish, Decay with imprecision, will not stay” Got it. But some of them seem to flip their meaning completely! Yeah, I kind of wondered if some people misread the axis at some points. Of course given that it was reddit, it’s not that out there some folks may just be trying to mess with us. “More probably than not” is another way of saying “preponderance of the evidence”. That is the standard of proof in all of my hearings, which is a contrast to a criminal trial where the standard is “beyond a reasonable doubt”. On this scale, I would say it is equivalent of “probably” except that, once I make a determination that something is “more probably than not”, it could actually be overwhelming evidence. So, in my line of work, it would be 51% to 100%. Anything below that and the case is dismissed. You know a legalese version of this would be fascinating. Ask lawyers and non lawyers to say what they think those terms mean numerically. I can understand some ambiguity of terms*, perhaps a regional or cultural difference, but some of the answers are just flat wrong. I define several as just a bit more than “a few,” which is less than what other people seem to mean. I have only learned this in the last ten years or so. I got in to an incredibly heated discussion once about the date range covered by the phrase “the other day”. I felt it was valid for about 6 weeks, and the other two people I was talking to both believed it meant something closer to “the day before yesterday”. I shortened my timeframe after that, but I still use it to mean up to 3 weeks or so. Yeah, everything that happened after my nearly 5-year-old son was born is now “fairly recently”. I do not forsee myself moving that goal post as he ages.